The afordable housing development would be built on a city-owned parking lot on Emmett Street. LOGAN SQUARE — A community group closely aligned with Ald. Carlos Ramirez-Rosa (35th) is pushing for a 100 percent affordable housing development next to the Logan Square Blue Line station. 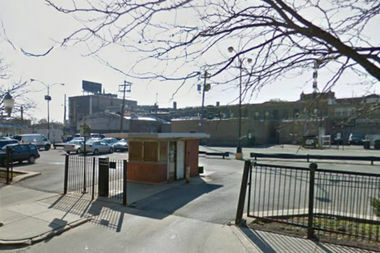 United Neighbors of the 35th Ward, a so-called "independent" political group the alderman helped create, has been knocking on doors asking for neighbors to support the housing development, which would be built on the city-owned parking lot directly north of the train station on Emmett Street. "On the campaign trail, Ald. Ramirez-Rosa indicated his support for the development of 100 percent affordable housing on the city-owned lot near the Logan Square Blue Line. Additionally, at community meetings held under the previous alderman, Logan Square residents expressed affordability as their number one desire for the city lot," the group posted on its website last week. The posting said that local nonprofit affordable housing developers recently have expressed an interest in developing the site. "We want to ensure that the interest of our community is clear — we want the development of a 100% affordable apartment building to keep our community economically diverse," the neighbor-led group said. Maeve Raphelson, co-chair of United Neighbors of the 35th Ward's affordable housing campaign, emphasized that the group is not affiliated with the ward office, saying the alderman is involved as a private citizen. In 2014, hundreds of residents overwhelmingly said affordable housing — plus green space and an indoor market — would be the best use for the "historically underused" lot during a series of community meetings and surveys led by then-Ald. Rey Colon and the Metropolitan Planning Council. Ramirez-Rosa called it a "robust community process" with more than 370 residents participating in the meetings and more than 500 people filling out surveys, culminating in a 20-page report. "Over 300 of them spoke up and said their number one desire is affordability," Ramirez-Rosa said. Since taking office, Ramirez-Rosa has been approached by several developers interested in the site. So far, none of the proposals have fully met the community's criteria, which the alderman said would be the basis for his support. He declined to provide names of any potential developers, saying identifying them would be premature. "The moment they come to me and say this is a real proposal: 'Here are the numbers, the math, and this is how we want to bake this cake ...' Once they reach that level of seriousness and they have a timeline, and it meets the criteria already established by the community, then at that point I'll take it to the community," he said. Andrew Schneider, president of Logan Square Preservation, said any development should go through a "robust process with ample opportunity for public input" because the lot is publicly owned. "We think that's important, because any development on that site could impact the pending redesign of the traffic pattern on Logan Square," Schneider said. He said Logan Square Preservation, which was involved in the 2014 community process, wants any development on the site to include a "substantial public amenity," such as a park, field house or community center, and a site for an indoor farmers market. But Ramirez-Rosa argues that affordable housing is a "substantial public amenity." "I believe affordable housing is a public use," he said. "I believe that long-term working class residents of Logan Square have a right to remain in the community. The only way we're going to accomplish that is with affordable housing. I've been unequivocal in that."